The attractive circular styling of this 4 way locking flap is popular for wooden panel doors in addition to glass and acrylic. It is particularly recommended for single/double glazing and very thin panels/screens. The number in brackets relates to the manufacturer's model number. We recommend that you ask a glazier to cut a hole of 8.75 inches (223mm) diameter in the position required, and then install the cat flap as detailed at 3 and 4 below. Alternatively, you may prefer to replace the glass panel with a clear plastic panel and install as detailed below. Please Note - It is not possible to cut a hole in toughened glass. Position cat flap frame on outside of panel and screw interior cover to it using the appropriate screw/spacer combination for your thickness of panel, (see table below). Do not overtighten screws. Cover screwheads with the caps supplied. To train your cat to use the cat flap, prop it open, (eg with a clothes peg), at first and use food as an encouragement. 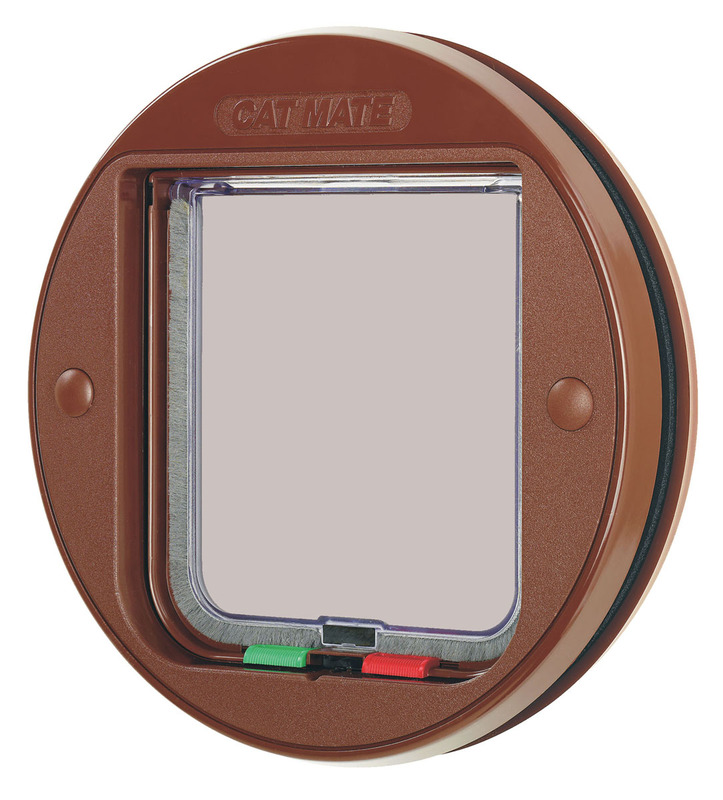 Below are some recent questions we've received regarding Cat Mate Glass Fitting Lockable Cat Flaps, including answers from our team. If cat flap is the wrong size can I send it back?